The KTM X-Bow (pronounced crossbow) is an ultra-light sports car for road and race use, produced by Austrian motorcycle manufacturer KTM. It is the first car in their product range. It was launched at the Geneva Motor Show in 2008. KTM developed the X-Bow in collaboration with Kiska Design, Audi, and Dallara. The X-Bow uses a turbocharged four-cylinder 2.0 litre Audi engine. The 2008 model produces 237 hp (177 kW; 240 PS) at 5,500 rpm and 310 newton metres (230 lb⋅ft) of torque between 2,000 and 5,500 rpm. and can accelerate from 0-62 mph (100 km/h) in 3.9 seconds. Its top speed is 217 km/h (134.9 mph). In the 2011 X-Bow R model, the Audi engine is further tuned to produce 300 hp (224 kW; 304 PS) and 400 newton metres (300 lb⋅ft) of torque at 3,300 rpm. Originally, KTM planned a production of 500 units per year; however, the company increased production to 1,000 cars a year and built a new plant near Graz due to high demand. The car has been raced at the Race of Champions all-star event since 2008. The KTM X-Bow was raced in the Supersport category of the 2008 FIA GT4 Championship (No. 100 Catharina Felser, No. 101 Christopher Haase and Dennis Retera, by Reiter Engineering), taking a podium finish at Monza and pole position in the wet qualifying session at Nogaro. The FIA-homologated KTM X-BOW GT4 is available for racing purposes. Marcus Clutton and Phil Keen won the supersports call of the 2009 British GT season, and Peter Belshaw and Clutton were the GT4 champions in the 2011 season. The KTM X-BOW Battle race series started in 2010 and was a support event for the DTM German Touring Car series at Adria Raceway in 2010 and Lausitzring in 2011. The GT4 X-Bow powered Brett Sandberg to the 2016 Pirelli World Challenge GTS Championship with multiple wins along the way. In a March 2012 episode of Top Gear, presenter Jeremy Clarkson drove a X-Bow around Donington Park circuit in England. He applauded the tyres' grip, saying during a James May-inspired session of doughnuts, "it's like driving on superglue." The X-Bow R model recently appeared in the free DriveClub Ignition expansion pack, Real Racing 3, Forza Horizon 3, Assetto Corsa, while the standard model has appeared in other racing games too, such as the iOS game GT Racing, the PS3 game Gran Turismo 6, and Project CARS. ^ "TFSI Technology from Audi". KTM. Retrieved 2009-01-21. ^ a b "KTM X-Bow receives Top Gear's "Sports Car of the Year" award". 4wheelnews.com. 2008-12-15. Archived from the original on 2009-01-09. Retrieved 2008-12-15. ^ Pollard, Tim. "KTM X-Bow R (2011) CAR Review". CAR Magazine. Bauer Media Limited. Retrieved 2 December 2011. ^ "KTM X-Bow gets own factory". Autocar.co.uk. 2007-09-21. Retrieved 2009-01-21. ^ "The Success Story - X-BOW Racing". Ktm X-Bow. Retrieved 2009-07-31. ^ "Results: 2008 Round 2 - Monza". Retrieved 2012-10-20. ^ "Results: 2008 Round 6 - Nogaro". Retrieved 2012-10-20. ^ ""GT4" - Models - About X-BOW". Ktm X-Bow. Retrieved 2009-07-31. 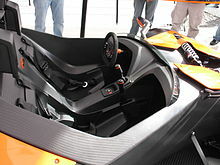 Wikimedia Commons has media related to KTM X-Bow. This page was last edited on 17 March 2019, at 01:22 (UTC).